Innovation Platforms (IPs) are being set up for building the seed value chains of groundnut and common bean. In the case of groundnut, the target is production and delivery of 533 tons basic seed and 8,000 tons certified groundnut seed in Tanzania. 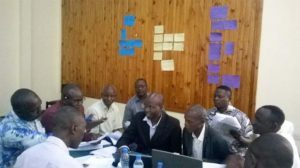 This has started with a training program with Tanzanian national partners and the Tropical Legumes III (TL III) support team. The participants, trained to be IP facilitators, were oriented on the TL III deliverables for groundnut and common bean that focused on varieties, associated technologies, productivity gains and dissemination of quality seed. Special emphasis was laid on closing gender yield gaps and assisting women to earn higher incomes. The targets of the seed roadmap for ICRISAT groundnut and the International Center for Tropical Agriculture (CIAT) bean breeding programs were discussed. At the end of the workshop, the participants came up with an action plan for setting up functional IPs or strengthening the existing ones in their respective areas. The training was conducted by ICRISAT-Kenya scientists, Dr Essegbemon Akpo, Scientist, Seed Systems Specialist, Seed Systems, Dr Monyo Emmanuel, Theme Leader Seed Systems and CIAT staff Dr Jean-Claude Rubyogo, Seeds Expert, Mr Enock Maereka, Seed Business Development Specialist, and Mr Wilfred Odhiambo, Agricultural Economist. A total of 24 participants attended the training held from 6 to 8 September at Moshi, Tanzania.